Why baseload should not be confused with “reliability” – and why building new coal fired generators – as proposed by conservatives in US and Australia – may make the grid less reliable, and more expensive. “Baseload power”, however, is a line encouraged by the fossil fuel industry, happy that “baseload” has become a marketing tool, in the same way that it has exploited the idea of “clean coal” and “energy poverty” to pursue their interests. The Brattle Group report was commissioned by the NRDC, a US-based NGO, just as the Trump administration prepares its own battle over the future of “baseload” in a rapidly changing energy market. It prompted this series of tweets. As in Australia, conservatives in the US are fighting back against renewables – and variable sources like wind and solar in particular – on the basis that baseload power should be protected at all costs. It was the central theme of former prime minister and back-bench rabble-rouser Tony Abbott’s latest salvo into Coalition party politics, and his desire for the government to build a new coal-fired power station, under the fantasy that this will somehow reduce costs. (It will do the opposite). He was followed by George Christensen, the Queensland MP wanting a baseload coal generator in the north of the state, to give people “power that they can rely on” and not have it derailed by “sacrifices to the climate gods”. Christensen clearly did not read the Finkel Review, or the latest BNEF analysis, because he thinks coal is half the price of solar. And it’s the line pushed by the Trump administration and its energy secretary Rick Perry. It’s a coal industry marketing point. But it’s a lousy argument that makes no sense in a world full of technology alternatives. Increasingly, more energy regulators, such as the head of the UK’s National Grid, and other energy experts are accepting this point. Perry’s comments were slapped down almost immediately by one of the country’s senior energy regulator. “It is absolutely not true,” she said on Perry’s false claims on wind and solar. And energy users are starting to come to this idea too. The best example is Nectar Farms, who were ready to abandon the building of the country’s biggest glasshouse for vegetable growing, and build it overseas, instead of western Victoria, before discovering that wind energy and battery storage could deliver the same reliability at a fraction of the cost of grid power and gas. “Why would we do it any other way,” says the CEO Stephen Sasse. Extraordinary, this tale of a half a billion dollar investment, 1,300 jobs and 100 per cent renewables was completely ignored by the mainstream media. You’d think it would be a great story for prime minister Jobson Grothe. And that explains the battle over baseload. The media runs with the coal industry talking point, it is infused in their discussions. How else could we deliver reliable energy, they ask. Well, by using smarter, cleaner, faster and more reliable technology for one thing, would be the answer from the likes of AEMO boss Audrey Zibelman. The new demand management recommendations coming from ARENA and the Institute of Sustainable Futures shows how these concepts like demand management can deliver the flexibility that the modern energy system needs, and save heaps on the cost of poles and wires. The key point is that it is important to have enough power to meet demand at all times – but there are smarter ways of doing this than simply relying on large, inflexible generators – that just happen to be dirtier and more expensive than the alternatives. The Brattle Report, like a similar analysis by the Climate Policy Initiative, and so many others before it, tries to puncture some of the myth-making around baseload. Just because a coal generator is big, and can go for 24 hours uninterrupted, does not make it reliable. To start with, the they can and do have unexplained outages, and the need for maintenance means that system planners have had to build in significant system upgrades, back-up and transmission infrastructure to spread generation over a larger region. The planners also had to provide “contingency” management processes to avoid blackouts when one or more of these large power plants experienced unexpected outages. All the redundancy that critics say have to be built for wind and solar, have already been built for coal and gas. Brattle points out events in Texas in 2011 when an unexpected cold snap forced 7GW of coal and gas-fired generation offline as equipment froze. Some 3GW of wind power was uninterrupted and helped keep the lights on. Similarly, during the 2014 “Polar Vortex,” many coal and gas plants had difficulties generating power, as equipment froze and coal deliveries were stopped. Wind resources in the Midwest consistently produced power that helped to save electricity customers more than $US1 billion in two days. In Australia, heat waves are having similar impacts. Reports into the various outages, load shedding and price spikes in Australia this past summer almost always point to the loss of capacity at coal and gas plants due to heat stress as the heart of the problem. But still, to many people, the basic premise of the traditional utility planning processes developed over the last few decades remains unchanged today, despite the fact that wind and solar are killing coal on costs, and battery storage and other smart software has emerged to provide faster and more efficient controls, and do things that big coal-fired power stations could never do. Brattle argues that system reliability is achieved through a mix of resources, not by any single unit. “There is no special need for continuous power supply to come from a single unit (when available and not on outage) rather than a mix of resources,” it notes. “It is a misconception that “baseload” plants (or any plants, for that matter) are 100% reliable,” it says. “Coal and nuclear plants periodically go on outage, and when they do, their outages tend to be long. “No generating plants operate 100% reliably in all hours of the year. All generators are prone to occasional unexpected outages and must regularly go offline for maintenance outages. “Electricity systems have always been managed ‘flexibly’,” it notes. “Weather, work patterns, industry, or even sports schedules create predictable or unexpected drops or spikes in demand. If renewable generation and battery storage prices continue to fall in line with forecasts, meeting demand in each hour of a year with 80 per cent of electricity coming from wind and solar could cost as little as $US70/MWh – even when accounting for required short-term reserves, flexibility and backup generation. In Australia, with even greater wind and solar resources, this is expected to be around the same price, but in Australian dollars. Either way, it is cheaper than what we have got now. And the US modelling was done with cheap gas prices. 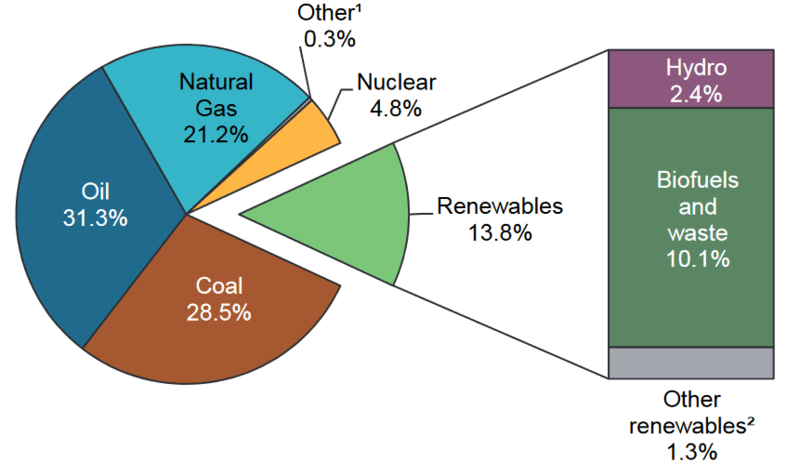 Australia’s Finkel Review came up with a much higher number because it assumed that gas would be needed to replace coal, a highly contentious assumption that seems to perpetuate the “baseload” myth. The CPI looked at grids and energy mixes in the US, India, Europe and Scandinavia. That is exactly the conclusion of the CSIRO, which points out that in Australia there is so much back-up already built into the grid, that anything less than 50 per cent wind and solar might be considered “trivial” in some areas. And they both agree on the second point: “Moreover, technologies that exist today could support much higher shares of wind and solar; 80% or more.” That means little if any “baseload”. Reliability is they key. Nectar Farms now understands this, it is time for politicians and mainstream media to move on. Your more likely to find Christensen’s head in a bible reading about his god’s creation of the planet eight million of us live on than reading the Finkel Report- much like Mad Monk Abbott and his followers. Most Christians do not read the Bible and have a very level of knowledge of what is in it. This is especially true of the “Hillsong-type” churches. My experience is that those in “Hillsong-type” churches read the Bible more than those in other churches. We have had the technology to do it for decades. Not as good as the technology now but it could have been done. Looking at the situation 2017, given the technology available, i would conclude that large base load coal is a realy bad idea in all aspects of where the electricity sector is going. Amusing to see Abbott’s priority 1 to save the nation is to cut all spending. Next line ssys government should build coal power stations. Such a plan would make the NBN look like lottery win. Maybe it’s just semantics, but if you look at any electricity load profile over a 24 hour period, there is still a need for power overnight. So at no point will there be no generation, and there is therefore a minimum amount of generation required. Is this not a ‘base’ load? Whether it comes from batteries, hydro, or some other dispatchable source, we consume energy at all times of day, and this needs to be supplied. Chris – words often get in the way of intelligent action. If solar and wind installations continue as they are now, there will be significant periods during the day when no other form of power is needed. The need for power at midnight will then be provided from sources available at midnight: storage, wind and hydro. Under this scenario there is no 7x24h inflexible power source needed. Baseload implies that somehow these generators are foundational or fundamental, rather than the true picture that they are very inflexible to control. Except when SA is running on GAS for around 14hours a night with only 2% renewable with consumption never dropping below 1.6GW. You would need a exceptional large wind/solar farm, as right now 1.5 gw is been used and only .5gw is renewable! So, you would need triple the current wind/solar farm to replace GAS right now and then triple that to then store the power for each night. Its only when you talk this scale you can reach 100% renewable. The other choice is to store power in summer (plenty wind and solar – long days and intensity) and utilise storage for winter. I don’t know which option would be cheaper? Then Australia needs 39GW so multiply the above by 25 and then double that to allow for 50million population by 2050…. Think it thru Joe – if SA were to run on gas for 14h a night for any length of time, prices would go thru the roof. This would justify more pumped hydro and batteries behind the meter. Solar panels are already so cheap that anyone can afford to have more than enough to supply all their immediate and deferred needs, and anyone in SA with paid off solar is in the money in installing batteries. That will account for a significant part of your 1.6GW with no wind, even without pumped hydro. Diversity in demand and supply between regions will contribute significantly as well. Your triple x triple is a misunderstanding of how all these elements come together, your mulitplication by 25 is fantasy. Well there must not be alot of solar batteries going around as its 1.6GW every night. Checked NEM right now and Solar for SA is 173mw while GAS is 970mw. So some one is paying…. Also the 39GW is Australia peak consumption which is 25 times SA. Yes, we do seem to have had some very calm nights of late. We have also had our driest June ever, but i digress…. We also have periods where we have plenty of wind. In fact SA is due to have constraints on wind over the next 48 hours due to 45 km/h winds. WTF? AEMO is being very conservative. Yes it happens, I have seen Wind at 98% renewable. Its the variance that’s the issue! All of your panels..batteries…inverters will have to be replaced within 15-20 years…some much earlier…as will the wind turbines that supply intermittent energy…and you’re not self-sufficient…no power in a blackout. Before long there will be many regulators breathing down your necks wanting to herd you into virtual power plants and demand management interfering in your energy use….less autonomy and privacy than if you’re dependent on the grid. .. Photovoltaic panels last much longer than 20 years. Here’s a report written in 2011 or 2012 discussing some panels that were still working at nearly-new levels after 35 years: http://www.presse.uni-oldenburg.de/einblicke/54/files/assets/downloads/page0009.pdf (PDF) It’s true that lead-acid batteries usually need replacing after about ten years, but batteries based on other chemical processes can last much longer. The whole point of having PV panels and batteries is to be partly or fully self-sufficient. If a house has PV and batteries, it can have at least some power during a blackout if it also has a switch to prevent sending power out to to the grid, which could electrocute the workers restoring others’ power. You don’t appear to understand how “demand management” and “virtual power plants” work. This couldn’t be more perfectly wrong if you tried. 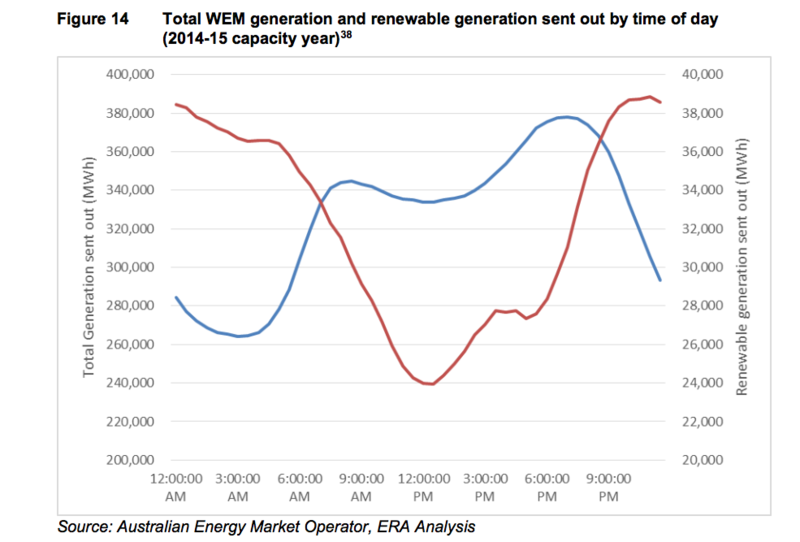 If it goes to zero demand at noon then that is zero baseload though. Even at higher baseload than midday zero coal struggles because it needs a certain C.F. to turn a buck. And the ramping, nope not ramping. Red line is Utility Renewables, Blue demand. Factor of ten scale difference in units. This chart is distorted by representing the figure over the year. The renewable’s are not any where the average in Winter, I have checked plenty of nights were SA is struggling at 2% renewable and that’s for 14hours ie Sunset/Sunrise. Demand also does not drop in winter staying around 1.5gw for the whole 24hours! The model we need is to cover demand vs production and I am starting to think Summer Storage of energy for Winter, will eventually, be realised as a given! The focus of this article will start ringing loud soon. Every renewable watt available makes coal a bigger problem to reliability. I really believe a coal generator being built would be the worst possible choice any australian government could make in the energy sector. The last thing SA needs is reliability leaning on a 600 mw coal generator. Put simply, you cang use a large base load generator as a basis of reliability. It creates a need for it but not a solution. Hang on how about Ultra-supercritical-Coal with CCS or Nuclear?! Coal got squeezed out of SA, there’s no place for generation that is dirty, has to buy fuel and can ramp to save itself when RE gets to ~40-50% of annual generation. Building a new one in SA with taxpayer or private money could never happen… but then I once though that about Abbott becoming PM! That why so many generators are being bought for private use in SA? Turbines that collapse and fling their blades or catch fire are pretty dirty oily terrifying things..and in any case manufacture of one turbine utilizes 220 tonnes of COAL..and 16 mined metals and minerals are used in the manufacture of solar panels…not to speak of the hugely toxic rare earths that have to be mined and processed for use in both…risking health and lives of many human beings…and complete apocalyptic devastation of the environment. Your pain is great, I can sympathise. You know that rare earths are in most every digital communications device known to man don’t you? No exclusive deal with the wind industry, and many turbines do not use large amounts of rare earths. If they were mined in developed countries (rare earths are not ‘rare’ in the sense of distribution just in sense of their concentration, we have most of them in Australia too) instead of the pollution outsourced to China like so many other environmental problems we could get on top of the pollution issues. Developed countries buy the rare earths from China because only China will put their populations and environment at the massive risk to health and devastation involved in mining and processing rare earths. Only coal has such causation attributed to it by RE enthusiasts…as they sneer at and dismiss health and amenity impacts of wind turbines…and the possible future health impact in making every little suburban home a 24/7 power plant. Imagine the pollution and devastation from rare earths for wind turbines if your dreams come true and every country is unnecessarily littered with them….many millions of them. Are you sneering at the digital device you are using? Good chance it has more rare earths than the 6.8K solar system on my roof. And if you have a smart phone it almost certainly has coltan mostly mined in the Congo by slaves and children in the middle of a “civil” war zone. Some of us are working towards a better world, others are content to make snide remarks. I don’t love to see “many millions of them” knowing full well many of the modern turbines are not big uses of these rare earths (unlike all the other industrial and consumer demand for rare earths). But even if Australia went to full wind capacity overnight using 5MW turbines it would be in the order of say 50,000 MW nameplate capacity to pick a round number, 10,000 turbines. Can’t see that scaling to very many millions of turbines the world over before solarPV has grabbed the lions share of global generation at a lower price even if there is a lot of excess generation spilt. Oh how nice it would be to have a small 500 watt wind turbine on every house in suburbia. It would cover most of my ‘baseload use’ (mostly) freeing me from those energy sucking devices like fridges, TV’s on standby over night, routers, clocks, etc. Unfortunately, my local council (Manningham, NE Melbourne) does not allow turbines on private houses. In fact, I don’t know of any council in suburbia that does… May there’s some allowed in other Cities ? I think you meant so many battery storage systems and large PV systems being bought in SA don’t you? If they have generators for peace of mind that’s okay with me. As long as generators are used less than 6 hours a year for next few years that’s an improvement on fossil gas running all year long. Well dream on about that-with the SA government reportedly having >$100million worth of diesel generators on order for next Summer! I’ve said this before, but the SA Govt should just borrow Tassie’s diesel generators for a while. Tas now has sufficient water for Hydro that they don’t actually need the diesel generators sitting on standby. Green Power is expensive because it is based on the price of LGCs, and the retailers pushed up the price of LGCs by refusing to sign any contracts for three years. Now things are being built, after the retailers could price the price no further, the price of LGCs will fall. No doubt the retailers will be as slow to pass on this benefit as banks are on interest rates. Not just on note paper, with paper money and paper balance sheets Wind and solar are now cheaper than coal. Solar + storage now cheaper than new coal in WA. Coal is subsidised in WA govt (could be up to 30%), this may well end as ALP promised to consider removing these subsidies during the election campaign. Giles – clearly the PMOs office will disagree with you on this for as long as they are run by the foreign funded lobbyists over at the MCA. And while the MCA remain with their hands on the wheel, they will continue to undermine the voice of Australian community groups trying to push for rational reforms and transition to the inevitable low emissions technologies of the future grid. About time respectable non-coal mining groups quit the MCA so their brands aren’t used to give credence to such a self-serving, outdated, taxpayer subsidised view of the world. Why does BHP still fund the MCA? Or RIO, given they are exiting coal as fast as they can? Yeah it was interesting how they had to disband the Australian Coal Association and roll it back into MCA mothership for defence after a particularly devistating series of own goals. My take out from the article is this. So Nectar Farms discovered that the best way to go was use the available energy here now in Australia as as the CEO said totally ignored by the pathetic media. Sad thing is Finkel took a punt each way and also said existing coal was in need of protection (until 2070 which means a 5–8º C of warming type GHG emissions curve) because only it could provide “baseload” and “synchronous generation” FCAS etc which is off course all complete F’ing nonsense, in fact it probably loses on cost for some of those services these days to wind with power inertia and primary response and battery FCAS. This is not the most fundamental assumption that the promoters of coal are using; refusal to accept climate science is the essential assumption that makes such proposals possible. Just as the ongoing amnesties on the externalised climate and health costs of emissions are the largest ongoing energy “subsidies” that distorts energy industry investment decisions. It would appear the Off Grid model of RELIABILITY having options of wind , solar , batteries and genset is now better than the Grid model ! You would have to ask why is the Grid unable to perform RELIABLY (as is claimed and proven now) and where did all those Billions of $ go (that many claim) were used to GOLD PLATE the network in the last 10 years. The Grid will become JUST another level of redundancy for them if they choose to remain connected. Not a baseload at all. except when you model winter cloudy days! You have poor light for 8hours and you use power for 24hours eg SA still uses 1.6gw all night long (14hours) and only has 2% wind renewable. So, if you only use the solar power you can generate each winter day, will mean you will have very little power at night – so no heating in the evenings or pre-dawn mornings! Generally PHES and CST+TS can cover it. For extreme wind droughts in winter with sustained heavy cloud cover lasting a week stockpile biofuels/biomass. Where did you get the idea the grid is so unreliable…except where power stations have been blown up…or shut down by energy providers to force us into unreliable wind/solar in which providers are heavily invested. If you think RE is so reliable and CHEAPER than Coal/Gas-then ask wind and solar farm operators to get off the government drip …do without ANY GOVERNMENT SUBSIDY NOW. It’s untenable to have their hand out to the taxpayer if they’re claiming to be a cheaper source than competitors who don’t get those subsidies…false pretences. 93% Uptime in Brisbane METRO one year. Due Floods. (2011) I never flooded. 97% uptime the norm any other year due lack of tree pruning bringing the grid down in storms , or doing repairs. I got sick of starting the generator to be quite honest. And regional NSW power goes out for 8 hours every month or more for maintenance as the Grid has no redundancy at all. Shops just close for the day ! Then Solar Panels came along from my neighbours in 2012 and my appliances started to fail as the mains volts approached 260 volts AC ! So if you don’t have or don’t mind the issues i had with the grid , or the grid support staff i suppose it is reliable then. For me life has never been better , or cheaper or safer ,. And that’s not even counting the cost of blown appliances ! Why didn’t you say in your article what Nectar Farms says itself…that Nectar Farms was putting its operation on hold because of the excessive power prices in Victoria and the insecurity of supply. Nectar Farms can reportedly only continue now because of a Memorandum of Understanding between the company, the Victorian Government and a French RE developer Neoen that’s building the Bulgana GreenPower Hub comprising 56 wind turbines and a battery storage system that will support it with 10% of power going to Nectar and 90% into the grid. There will only be 20 permanent jobs at the hub and 300 at Nectar Farms. Total cost for that 320 job installation is $565million. How much of that is a government subsidy…must be quite a bit as Nectar was unable to proceed on its own….and we know the wind farm attracts a huge subsidy. Hardly an example of cheap and reliable RE. Before she became CEO of AEMO a few months ago, Audrey Zibelman was under a lot of scrutiny in her New York State job for her undisclosed conflicts of interest and her husband was reportedly planning to provide a new RE grid for the US…and she came to AEMO committed to shutting down coal and ‘transforming’ Australia’s energy supply via wind, solar with storage and demand management…so she was NEVER open to using Australia’s resources at all. Last time I read anything about it , there was a lot of anxiety about the situation she left the energy supply business in….in New York State . When you say ‘wind and solar are killing coal on costs’….is that after taking into account all RE subsidies…and Finkel’s Generator Reliabilty Obligation Cost? If so will you call for all the RE subsidies to be removed once wind farms etc do what’s required to comply with that obligation? I’ve lived up and down the East coast of Australia for many years and outages in that time have been EXTREMELY RARE. COAL-fired power is exceedingly RELIABLE. “is that after taking into account all RE subsidies” ? Yes. RE is performing most consistently well in the parts of the world which have no subsidies. This is not yet government policy. Crikey the Finkel Report only came out a few weeks ago, how fast do you think governments move? “COAL-fired power is exceedingly RELIABLE” ?? Oh really. Where were you living when COAL-fired NSW was smashed by big east coast lows in recent years causing week-long power outages in parts of Sydney and many other regions? Trees brought down and roofs ripped up by storms and ‘east coast lows’ will just as easily damage solar panels-and wind turbines that have to be shut down to prevent damage if the winds are TOO strong. And it’s not as if solar PV is going to provide you with power in those conditions is it? And I reiterate…blackouts with grid coal-fired power have been exceedingly rare…until the RET and the disgraceful DIVESTMENT campaigns put coal-fired power stations on death row…and the Generators decided to sideline coal and heavily invest in windmills. Can you tell me which industrialised countries ‘RE is performing most consistently well’ please? If RE investors were not factoring in asap the possibility of the Generator Reliability Obligation cost , they would surely be derelict. RE developers/investors do factor storage into consideration of new projects as a matter of common sense now that storage is lower in price. As for the Generator Reliability Obligation – well at this stage it’s only a suggestion in a report which the Coalition will probably roundly reject. The Coalition is resembling a blue at a barn dance these days and they probably won’t formally respond to the Finkel report for a long time, and they’ll no doubt release that response on a Christmas Eve! So RE investors already do consider storage, but they won’t be “derelict” if they don’t factor in the “cost” of a 3 week old idea from a report which the government will probably reject. OMG you’ve come to the right site to read about the countries where RE is performing most consistently well! RenewEconomy has literally dozens of articles on the record low prices of wind and solar all around the world. Try typing some of these places in the search engine, just for starters. Happy reading. 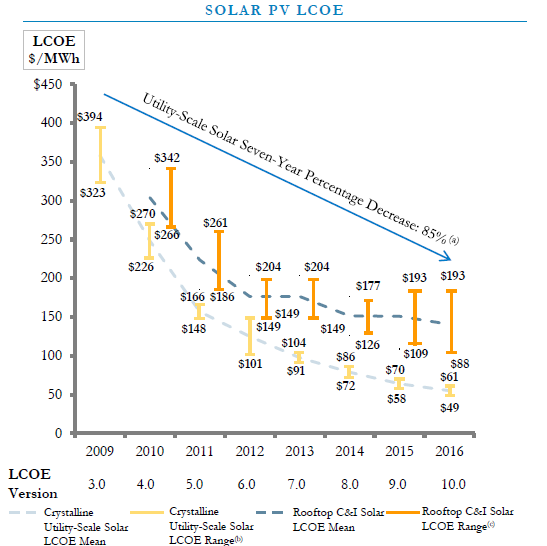 More broadly, see the cost reduction trend in UNSUBSIDIZED wind and solar in the most recent Levelized Cost of Energy (LCOE) report. As you can see none of these countries rely …..or expect to any time soon…on wind and solar to any significant extent at all. All rely on FF…most have hydro and some nuclear to fall back on in any case. Australia has very little hydro and what we do have is drought-vulnerable as Tassy showed in the last few years…and of course we have no nuclear or any prospect thereof. Australia is alone in this…the only country without nuclear or massive hydro that’s hurtling towards energy insecurity and deindustrialisation by shutting down our reliable power—refusing to replace it…to rely on unreliable windmills and solar that are only less than 1.3% of the WORLD’S energy mix for goodness sake…and wind a statistical 0% of the WORLD’S energy mix. This is truly INSANITY ! Unless the incompetent Malcolm Turnbull can persuade coal plant owners…especially AGL… to keep their plants open as long as needed…Australia is stuffed! And that’s not likely as AGL’s heavily invested in RE and plans to her all of you solarPV enthusiasts into virtual power stations so their US partner SUNVERGE can make squillions from you. This truly is the heist of the millennium for the hoax of the millennium…and if you bother to research it you WILL FIND the warmist scientists’ work doesn’t stand up to scrutiny…about 60 peer-reviewed papers per year by world-renowned scientists explain why….and the hockey stick scientists themselves have just admitted it in recent weeks. Australia is committing suicide for a HOAX. 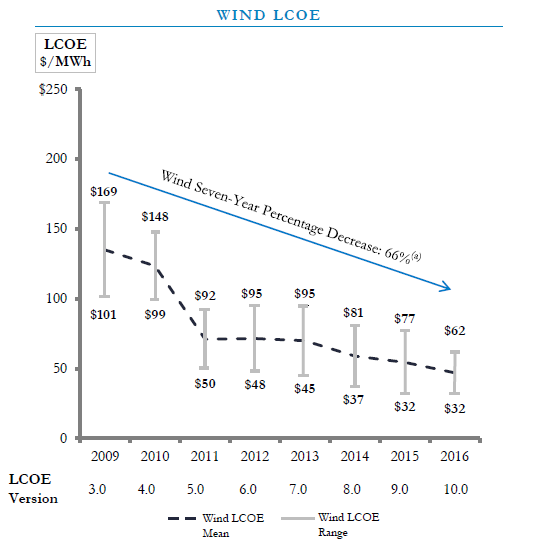 Did you even look at the solar and wind cost curve charts (below)? Think ahead a decade – what happens when solar has dropped ANOTHER 85% of unsubsidised cost and wind has dropped ANOTHER 66% of unsubsidised cost and batteries have made a similar drop in unsubsidised cost? While coal, gas and nuclear power have continued to RISE in cost. The overriding theme of this transition is climate change, but it’s also the world’s greatest economic opportunity to break the high-cost shackles of fossil fuel utility-provided energy. you misleading troll. India aiming or 57% by 2027, Dubai 25% by 2030. No, storms don’t “just as easily” damage solar panels and wind turbines. It easier for a storm cell to knock out a 1GW coal burner in its single location (or its grid connection) than an entire 1GW of distributed/geographically dispersed renewables. Really the only answer to better storm resilience is more storage, and the more highly-distributed and the more behind-the-meter that storage is the better. Behind-the-meter batteries will provide people with enough power to do the basics during a storm if their grid goes out. Storms are predicted literally days ahead, so people will have enough notice to charge up their battery in preparation. Behind-the-meter batteries in combination with smart grids can also provide instantaneous loss-less load shedding in times of emergency. Okay then, let’s talk insolation, because that’s what this is all about. Insolation is the amount of light falling on those panels to generate power in each of those individual solar cells, and there’s usually 72 individual cells to make up a solar panel, the more cells, the larger the output of that panel. When the Sun is directly overhead, the cells generate their maximum, so as the Sun rises, and then falls, the cells generate less. Also, there is a difference between Summer and Winter, again due to the angularity of the light falling on the panels, in much the same way as that angle differs as the Sun Rises and falls. Now, that maximum is usually at a single point during the middle of the day, but it’s curved, and the whole insolation period during the day looks similar to a bell curve, so zero just before the Sun rises and after it sets, and then rising during the morning and falling after that peak. Okay, this Thread mentions dust etcetera subtracting from the maximum insolation, hence power generation. Let me say here, that even the most pristine, cleanest perfect panel will NEVER generate its maximum, and you might think that where I say ….. never, that’s pretty definitive. As an example, I’ll show you actual insolation curves for a (relatively) large scale solar power system, and this is the one at UQ. What I have done here is to pick the best ones I could find for both Summer and Winter, not all that easy really as in Summer, you’ll only get around 10 or twelve days where it’s as good as this, and similar in Winter, also around 10 to 12 day where it is at best, with no overcast at all during the day, because any overcast, even a cloud flitting across the face of the Sun detracts significantly from the total power being generated, and after passing generation takes time, (albeit small) to build up again. Okay, now look at the left of the image with the informational data and see that this system has a maximum power rating of 5796KW, so that means this good day, the power generation was only 82% of maximum rated power. Note the best day was only 5243KW, and that’s 90%, and if you click on it, you’ll see it was an overcast day, probably with some rain to clean the panels to their best, hence a little higher generation, but still only 90%. Okay now, keeping that in mind, let’s then look at the Jacobs Report, which Finkel based his assumptions on. Once at that link, scroll down to the top of page 31, and you’ll see their version of those Summer and Winter insolation curves. Not how both curves look nothing like ….. real insolation curves, rising almost vertically to 100% in Winter and staying there from 10AM till 2PM, and in Summer, similar, staying at 100% for almost nine freaking hours. These insolation curves are so far divorced from reality, that they are positively laughable. People actually believe this stuff without even bothering to go and check. This is what future power generation requirements get based on.